Outsourcing is something which is practiced for any organization or company which needs aptitude or proficiency in a particular sector that they can’t facilitate from their own company. Conventionally it can be said that, the primary concern of outsourcing is to expand the company’s profits and boost it’s worldwide. Online outsourcing gives a company a lot of competitive advantages and fosters the business rapidly. So Outsourcing Learning Opportunities in Bangladesh should be an essential scheme to keep pace with the business policies of first world countries. U.S. companies mainly choose outsourcing to minimize the labor cost as they have the freedom to recruit employees from South Asia instead of giving work to their own professionals with a high price. Their target workers are mostly from India, China and Philippines as the workers are well trained in technology required and well-spoken in English. Report on ‘How Outsourcing Jobs Affects the U.S. Economy’ by Kimberly Amadeo shows that, a company pays an IT worker from entry-level only $7,000 in China and $8,400 in India yearly. Coming back to the point of engaging workers from Bangladesh, we may assume that it would be more cost effective idea to distribute works among the workforces available here. The outsourcing marketplace has already become apparent in our country. Undoubtedly, U.S. companies may like to hire even they are hiring the workers from this part of Asia with a cheap rate of wages since the living standard is pretty low in Bangladesh. To grab the newly emerging marketplace of outsourcing necessary training or learning center is required. Although there are a few out there in Dhaka, the capital of Bangladesh. But the proper guideline is provided by only three to four organizations which is not surely sufficient to meet up the demand of the active manpower needed in the field of outsourcing. Moreover, the admission fee offered by them seems to be unnecessarily high. So many enthusiastic people sometimes step back from getting admitted into these centers. But still some of them offer an optimal rate for admission which most of the people can afford. It can eradicate unemployment problem to some extent. It can add some supplementary income to an individual who is already enrolled in some other occupation. It can generate money without any monetary investment. Anyone with proper skill can start outsourcing as it is an open profession. It can be a flexible profession for the women especially for those who don’t work outside. One of the most popular aspects of freelancing is Affiliate Marketing. This is a passive way of earning money although one has to steadily work hard on it previously to pull the targeted traffic on it. Another feature of freelancing is SEO (Search Engine Optimization) which involves convenient content writing with commonly used words and phrases people write in the keyword bar to find the desired product. These two features are frequently done by the freelancers nowadays. There are so many other traits in freelancing to choose for oneself like SMM (Social Media Marketing), Article Writing, Google Adsense, WordPress Web Design, Graphic Design, Web Development, CPA Marketing etc. It is also popular with the people. For performing all the crucial parts of outsourcing one needs to know each and every details of it. Because freelancing is a calculative task. It may not seem that tricky. But without enough research work or analysis it may ended up with a failed attempt. For getting the genuine information about all the related tasks of freelancing one has to be guided by the right person or the right center. Advance IT Center is such an organization which renders training along with precise knowledge of outsourcing. And most importantly, it offers a reasonable fee for admission which can be easily afforded by anyone. Our youth should be engaged more and more to online outsourcing as unemployment is one of the major problems of Bangladesh. Job market is gradually shrinking not only in Bangladesh but also worldwide. When someone finishes up with his study, he may not able to find a suitable job for him as most of the companies requires at least 3 to 4 years experiences for that particular job. This situation is undeniably frustrating. This is a common scenario for many. If these unemployed youth can be motivated and trained up for online outsourcing, then they can be the assets for the country rather than being burden for the family and the society as well. Another initiative can be taken by the respective authority for upholding the necessity and a brief summary of freelancing. As a couple of years ago, one mandatory course ICT (Information and Communication Technology) has been implied in the national curriculum of Secondary School Certificate (S.S.C) and Higher Secondary School Certificate (H.S.C), online outsourcing or freelancing can be included in a section of this course so that the students have no ignorance of the things which actually is going on. 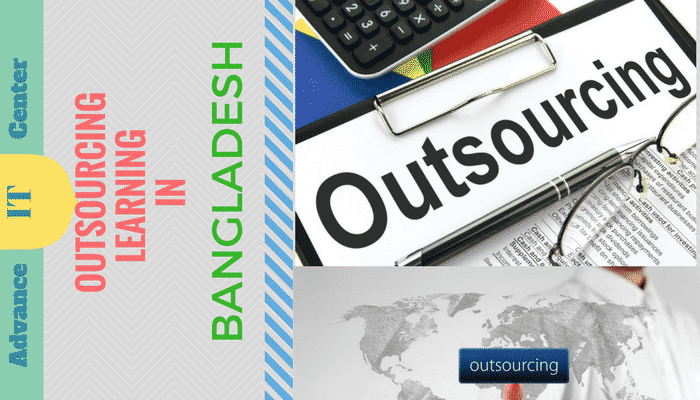 Bangladesh has immense scope for outsourcing in global market which is evident by the recent success of the freelancers. In no time we will be able to get one of the most reliable places in online workplace globally. For that, the youth and the interested people must learn outsourcing and its related tactics as the market is highly competitive. So, without knowing the perfect strategy one may not be able to survive in the long run. The existing opportunities for learning outsourcing may not be sufficient but we need to cope up with this to go ahead. On top of that, one may have the personal interest to be a freelancer which is pre-requisite for being successful. We need to grow with the constraint we have but sticking to the goal may lead us to the highway we dream to be on.